Most trips have a final destination -- an end point. 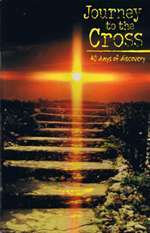 The Journey to the Cross appears to end at the empty tomb. But each time we journey with Christ to the cross, we are moved and transformed by the discovery of the love of God that compelled him to make such a sacrifice for us. When we are touched by this love, we are profoundly changed. That's what this journey will do -- give you a deeper appreciation for what God has done for you, a renewed passion to follow Christ daily and a fresh eagerness to run from the empty tomb and share Christ with all you meet.